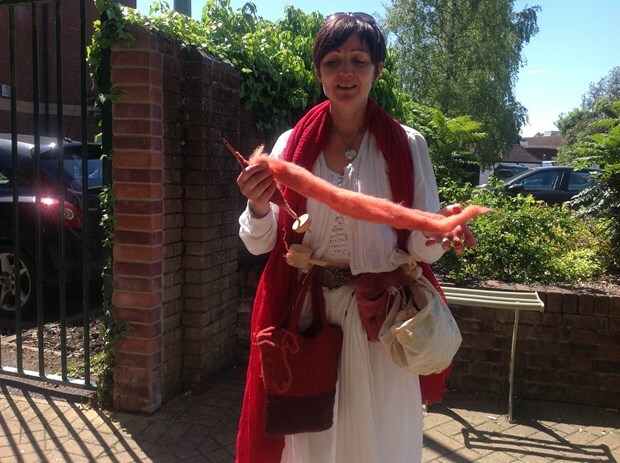 Drawing from the history of the woollen industry, Laurence will walk the heart shaped route of Andover town, (once a route used by farmers to bring sheep to the market). On her way, she will hand spin local wool, carrying a spindle on a belt to replicate a tradition from Eastern European countries. The women would mix their wool work with other daily chores; the tradition is for their husband to decorate the belt they carry as an expression of love towards their partner. While walking Laurence will engage with Andover people and collect love, connection and serendipity stories from Andover Town. Each story will be represented on the belt. Meet her in the street while she walks and offer your story. Follow the thread and create connections with Andover people, with artists and with the rest of the world.